Whip up Basic Bavarian Cream for a tasty dessert or side dish. All you need to make Basic Bavarian Cream is water, whipped topping and fruity gelatin. Stir boiling water into gelatin in medium bowl at least 2 minutes until completely dissolved. Stir in cold water. Refrigerate 1 hour 15 minutes or until slightly thickened (consistency of unbeaten egg whites). Gently stir in whipped topping. Pour into 4-cup mold or individual molds sprayed with cooking spray. Unmold dessert onto serving plate. 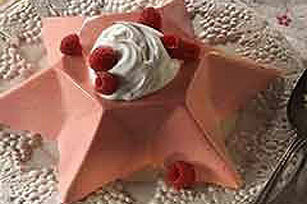 Garnish with 1/4 cup each additional whipped topping and fresh raspberries, if desired. Store leftover dessert in refrigerator. Save 1.5 grams of fat per serving by preparing with COOL WHIP LITE Whipped Topping. Prepare gelatin mixture twice, using a different flavor of JELL-O for each batch. Layer alternating flavors of gelatin mixture in 12 parfait glasses; refrigerate until set. Makes 12 servings.